Humpback whales are probably the most commonly sighted whale species on our trips. Humpback whales travel either alone, in pairs, and very occasionally in small groups of three to seven animals. Larger aggregations are occasionally seen when food is particularly abundant. Humpbacks start arriving in our area in the late Winter and very early Spring (by the beginning of March) with males and juveniles arriving first, and female whales with new calves arriving last (usually by mid-May). When the Humpback whales arrive in our area they are hungry and ready to begin feeding. A Humpback whale will feed for up to eighteen hours-a-day, all summer long. Each whale can consume nearly three thousand pounds of fish (well over a million calories) per day! The whales consume this massive amount of food each day because they need to build-up a thick layer of fat (“blubber”) that helps keep them warm and serves as an energy reserve for the whales long migration. Each winter nearly the entire population of Humpbacks we see off the New England coast migrates fifteen-hundred miles to the warm, tropical waters of the Caribbean to mate and give birth to their calves. This is also where the male Humpback whales sing the majority of their elaborate songs for which this species is so well-known. These warmer regions of the ocean, however, are much less productive than the colder waters of the Gulf of Maine. As a result, the entire time that the Humpback whales are singing and mating in the Caribbean (November-March) they hardly eat at all! Some Humpback whales will lose up to 25% of their total body weight (or about 20,000lbs of blubber). So it’s not surprising that they are so intent upon feeding after returning north to New England! Feeding behavior is commonly seen on our trips. Humpback whale feeding behavior consists (usually) of the whales blowing huge clouds or rings of bubbles around schools of fish. The bubbles then rise around the fish which are confused and trapped inside the column of rising bubbles. This makes it easier for the whales to catch such fish species as Sand Lance, Mackerel, or Herring, which are faster swimmers than the Humpbacks are. By employing this system of bubbles the humpbacks can concentrate and consume these fast-moving fish in mass quantities. This “bubble feeding” behavior is unique to the Humpback whales and has been observed in many Humpback whale populations all around the world. Interestingly, different populations of Humpbacks exhibit slight variations on this bubble-cloud-method of feeding. In the North Pacific, for example, Humpback whales almost always work in groups to net fish in a hollow ring (or cylinder if viewed beneath the surface) of bubbles. While “bubble rings” are also employed in the North Atlantic, they are much less common than “bubble clouds” (one solid mass of bubbles). Are these feeding behaviors the result of the whales targeting different prey? Is feeding strategy learned when Humpback whales are calves and watch older whales feeding? If so, could this account for regional variations in feeding strategy? Consider this: In the past 15 or so years a new feeding strategy has emerged in “our” population Humpback Whales. A method of feeding called “kick-feeding” or “flick-feeding” began with just a few individuals then spread through the population. In the early 1990’s, a few individual Humpback whales started pounding the surface of the water with their tails before diving beneath the surface and blowing a bubble cloud. Why they started this behavior no one knows. Perhaps pounding the tail at the surface stuns fish making them easier to catch. Perhaps it simply marks the spot where the whales intend to feed. 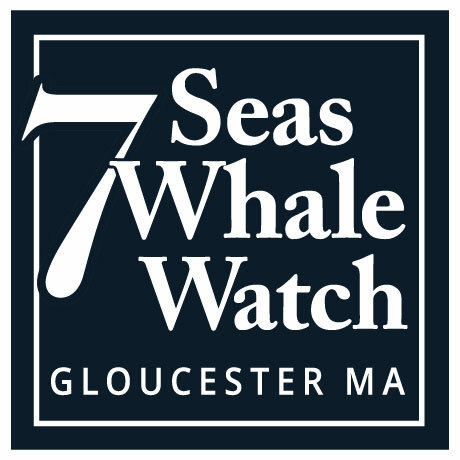 What we do know is that kick-feeding is now observed in many, if not most, of the Humpbacks in the southern Gulf of Maine. This is when Humpback Whales (or occasionally other whale species) lay on their sides or backs at the surface and raise one or both of their pectoral fins in the air. 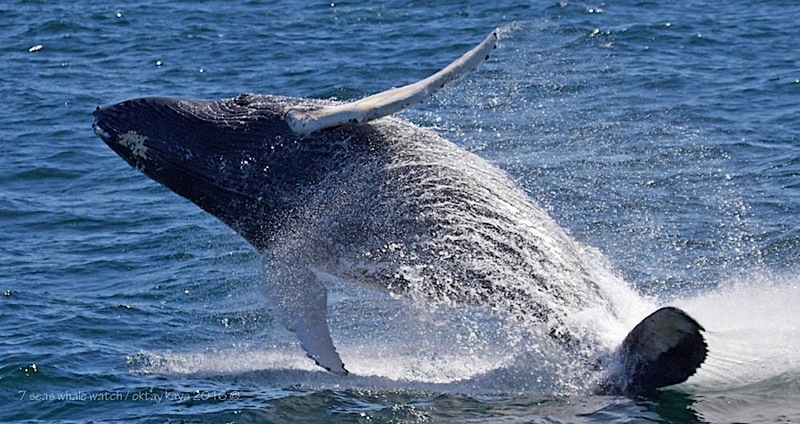 Humpbacks have unusually long side flippers (~15 feet long) which led to their being given the scientific name “Megaptera novaeangliae” or “Big-winged New Englander”. Humpbacks often repeatedly strike the water’s surface with their flippers which produced a loud slapping sound that can be heard a great distance both above and below the water. This behavior involves the whale twisting and throwing the entire posterior end of its body out of the water. A slight variation on tail breaching is “tail-lobbing”. This is when the whale lays on its back and repeated thrashes the tail and pounds at the surface. Perhaps the most sought-after behavior of the Humpback whale (and certainly the most common photo on any whale watch company’s brochure!) is breaching. In this spectacular display of athletic prowess, the whale will dive beneath the surface for a few seconds or minutes only to surface vertically with great speed. Often the animal will twist while in mid-air and then come crashing down with a thunderous splash. Breaching is actually quite common amongst Humpbacks and is observed with surprising regularity on our whale watch trips. Your chances of actually seeing a Humpback whale breach is quite good (about 50/50) when Humpbacks are plentiful… as they have been in recent years. When it comes to your getting a good picture of this behavior, behavior, the chances aren’t so good. For you see it is very difficult (but not always impossible) to predict when and where a breach is going to occur. Getting a good breach photograph requires skill with a camera, a little knowledge and experience with Humpback Whale behavior, a bit of luck, and a whole lot of patience. Even if you don’t manage a great photo of a breaching whale, just seeing a 45 foot, 80,000-pound animal leap clear of the water’s surface is a special experience. Even from a distance, this behavior is spectacular. Sometimes we even find whales that are many miles away by the splashes these breaches produce. Imagine making your way off-shore on a calm, sunny day when you can see clear to the horizon. You may be scanning the distant horizon for the tell-tale “blow” or “spout” produced by the whales when they surface to breath. Suddenly, in the distance, a huge plume of white water rises 100 feet into the air and then settles back at the surface. What could have caused a splash that big? In these waters, it almost certainly was a breaching Humpback whale. 1. Whales breach/flipper-slap/tail-breach/etc to help rid themselves of parasites. This may at times be true. Whales do carry a variety of external (as well as internal) parasites that may cause irritation to their sensitive skin. These parasites include barnacles and small crustaceans called “Cyamids” or “Whale Lice”. They congregate on rough or folded regions of the whale’s skin and feed directly on the whale’s skin tissues. Perhaps the tremendous forces associated with surface activity helps the whales rid themselves of these unwanted pests. 2. 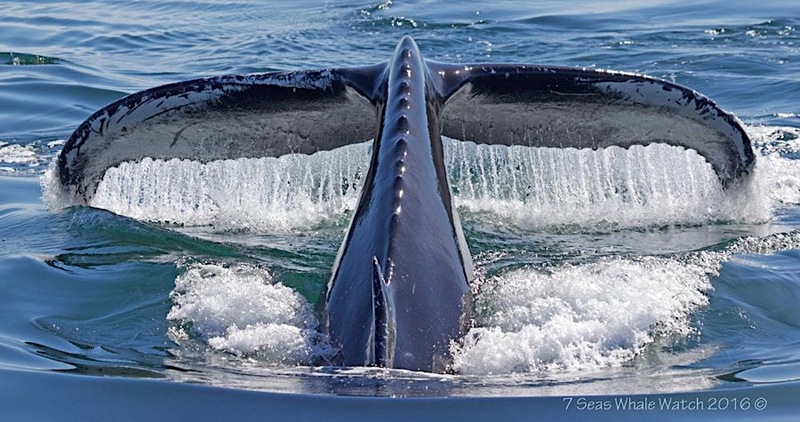 Whales breach/flipper-slap/tail-breach/etc to help move food along in their digestive tract. As previously stated, whales in the Stellwagen Bank/Jeffrey’s Ledge region are here for one reason: to feed. Humpbacks consume over 1 1/2 TONS of fish every day… that’s well over a million calories worth! Some people have theorized that increased activity may help move food along through the whales digestive system. 3. Whales breach/flipper-slap/tail-breach/etc to communicate with one another. This is perhaps the most widely accepted theory of surface activity today. If you are fortunate enough to take a whale watching trip to Stellwagen Bank or Jeffrey’s Ledge and witness surface active Humpback Whales yourself, you will no doubt be struck by the tremendous amount of sound created by the pounding of tails, flippers, and even the whole whale! More than once in the time I’ve spent working with 7 Seas we have actually found whales in the fog by stopping the engines and listening for the sounds produced by active whales. Now consider that sound travels about four and a half times faster through water than it does through air. Water also conducts sound signals “better” than air in the sense that sound signals do not degrade as quickly in a liquid medium (such as seawater) as they do in a gaseous medium (such as air). So it is not unreasonable to think that when a whale is, let’s say, flipper-slapping that other whales, possibly tens-of-miles away, could be hearing the sounds produced. In fact, there have been times when we are watching a whale that suddenly becomes active and then we observe splashes in the distance a short time later from other whales that we didn’t even know where in the area! It seems as if these whales heard the activity of the whale that we were observing and then answered back in kind. Much of the data collected by naturalists aboard whale watching vessels seems to corroborate this idea. Still, even if it is shown that whales display surface active behaviors to communicate with one another, what are they actually saying? Could it be a sign of aggression or annoyance? Territorial displays between rival males? Displays performed by males to attract the attention of a nearby female? A warning of an approaching ship? Or information about the abundance (or lack there of) of schooling fish to eat? In conclusion: No one knows why whales exhibit these spectacular behaviors. They probably become active for all these reasons listed above at one time or another. In the case of calves I have no doubt that it is often times just for the fun of it all. Young whales, like the young of all mammals, have an unstoppable sense of play that is very important for exercising growing bones and muscles while also building body awareness and agility. All we as whale watchers can do is hope to be present when these behaviors occur… and hopefully, we’ll have our cameras ready too! As spectacular as breaching may be, my personal favorite behavior of the Humpback Whales is not quite so demonstrative, but equally as spectacular. This behavior is the aptly named “close-to-boat” behavior so often associated with Humpback and Gray whales (Grays are found only in the Pacific). In this behavior, the whales take the time to investigate a boat full of people who have set out to sea to observe the whales! Whales often times turn themselves vertically in the water and poke the tip of their rostrums or “noses” out of the water to get a better look at their surroundings. This behavior is called “spy-hopping”. I often wonder what the whales must be thinking when the are investigating our boat: Do they see the boat as an inanimate object with numerous individual living entities onboard? Or do they see the boat and all the people as one, strange, rather noisy creature? Perhaps they are thinking something else entirely. Regardless of what is going through their minds, close-to-boat behavior offers us a chance to get closer to a wild, endangered whale that we normally could because the whale has chosen to approach the boat at such close range. As spectacular as breaching may be, you never get such an impression of the true size and strength of these creatures as when you are just an arm’s-length away! At this point, you may be wondering how it is we have learned all this stuff about Humpback Whales. The reason is because we have learned to recognize not only what species of whale we are seeing (in this case Humpbacks), but also which individual Humpbacks we are seeing. This allows us to trace generations of whales as females give birth to calves who in turn give birth to calves their own (usually starting around age five or six) and on through each subsequent generation. We can also, therefore, observe the relationships between whales that are known to be closely related (or not), of the same age (or not), and so on. We are just now, after 30+ years of research, beginning to unravel the mystery of these animal’s social structure and hierarchy. Much of what you have read in these pages, and much of what you will hear from the naturalist on-board your whale watch, was learned via research conducted on this population of Humpback Whales on an individual basis. But how do we recognize individual whales on the open sea? Well, for the Humpback Whales anyway, it’s fairly easy. All one needs to do is get a good look at the whale’s tail! The ventral side (under-side) of a Humpback Whale’s tail ranges in value (not “color”) from purely white to solid black with all sorts of intermediates. “Type-one” tails are all white, “type-5” tails are all black, “type-3” tails are about half white/half black, and so on. So the pattern of black-and-white pigmentation on each whale’s tail is much like a fingerprint… no two tails are exactly alike. So all researchers need to do is get a good photo of the underside of a whale’s tail to be able to recognize that individual Humpback Whale each time it returns to the area. For seasoned researchers and whale watchers, many individuals have become like old friends and we look forward to seeing them upon their return from the Caribbean each spring.